But European officials said the unsolicited report from PwC ‘misinterpreted’ the relevant rules. IRELAND SPENT MORE than €440,000 on an unsolicited report defending Apple before the EU delivered its ruling the tech giant was handed illegal state aid for over two decades. The report, put together by global consultancy firm PwC, supported the way the US multinational allocated profits to its Irish operations – the nexus of the EU’s case against the state. 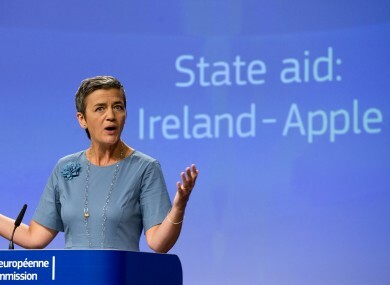 Although European officials didn’t request the report, it was handed to the EU in February 2016 – about six months before the European Commission revealed its finding that Ireland gave Apple illegal state aid worth €13 billion. As early as 2014, when the EU first announced a formal investigation, government figures said they planned to fight any negative ruling. 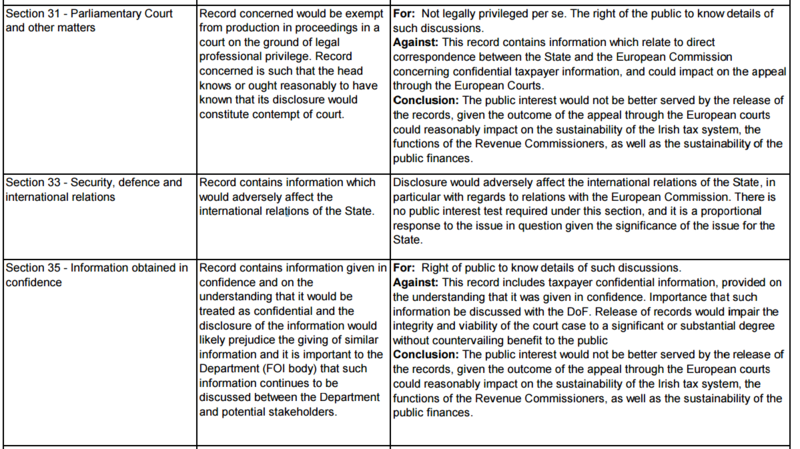 The Department of Finance did not respond directly to questions when asked by Fora why the government decided to spend €441,650 commissioning the PwC report when the EU hadn’t asked for the material. A spokesman instead pointed to a response Finance Minister Michael Noonan gave Sinn Féin’s Pearse Doherty providing a breakdown of the €1.8 million Ireland has spent defending the Apple case so far. Both the government and Apple are fighting the EU ruling, with Noonan recently telling a parliamentary committee he didn’t know what the final cost of the legal appeal would be as the case could last four or more years. Fora requested a copy of the PwC report under the Freedom of Information Act, however the Department of Finance knocked back the application on the grounds it included “commercially sensitive” information from Apple, among other reasons. Finance officials said the public interest “would not be better served by the release of the records”. While the full details of the document remain private, the European Commission’s full statement on the Apple ruling said that, according to Ireland, the PwC report “supported its view that the profit attribution to the Irish branches of ASI and AOE endorsed by Irish Revenue in the 1991 and 2007 tax rulings was at arm’s length”. ASI (Apple Sales International) and AOE (Apple Operations International) are the two companies at the heart of the EU’s investigation into Apple’s tax affairs in Ireland. Revenue issued two tax rulings, one in 1991 and one in 2007, which the EU argues allowed Apple to “substantially and artificially” lower the taxes it had paid in the Republic since 1991. ‘Arm’s length’ refers to how multinational companies move their money around and is based on a policy that cash be shared “between group companies in a way that reflects economic reality”. The EU generally accepts that companies subscribed to this principle are applying tax laws properly. Therefore, the PwC report was arguing that the way in which Apple had allocated the profits of these two Irish companies – an approach endorsed by Revenue – was done in a way that properly applied tax law. The EU commission eventually found that this was not the case and that Apple’s allocation of billions in profits to a ‘stateless’ head office with no premises and no staff didn’t represent economic reality. In its full, 130-page ruling, the EU makes several technical criticisms of the PwC report, including that it “misinterpreted the authorised OECD approach” to attributing profits. The Department of Finance, Revenue and Apple all strongly dispute the EU’s findings. Much of the €1.8 million spent on the case so far has gone to lawyers, while PwC Belgium has received a total of €595,400 from Ireland – the most paid to any one party in connection with the case. UK barrister Philip Baker QC, who specialises in taking corporation tax cases to the European Court of Justice, received the most of any legal expert. He was paid €267,470 between 2014 and 2016. Email “Ireland spent €440k on a report defending Apple months before the EU's scathing tax ruling”. Feedback on “Ireland spent €440k on a report defending Apple months before the EU's scathing tax ruling”.